While they’ve been united for a long time, there’s one thing they haven’t done since going public with their relationship — appear on the red carpet side by side. That’s why people are buzzing about Mila Kunis and Ashton Kutcher walking the red carpet together — it’s that much of a rarity. The two made their appearance together for the Breakthrough Prize Ceremony, otherwise known as the “Oscars of Science.” This is the sixth year that the Breakthrough Prize Ceremony has taken place, and iconic actor Morgan Freeman had the opportunity to host it this year. It’s possible that Kunis and Kutcher haven’t walked the red carpet together since both of them have been incredibly busy. After having their daughter, Wyatt, and getting married in 2015, the couple welcomed son Dimitri just a year ago. Aside from her ongoing role on Family Guy, Kunis has appeared in a few films since Dimitri’s arrival, including A Bad Moms Christmas. As for Kutcher, he was recently seen in The Ranch, a Netflix show about a football player who returns home to help with his family’s business. It’s pretty nice that they both got a bit of a break to spend time together at the ceremony — and the fact that they looked incredible for it was just a bonus. Kunis’s floral skirt makes us long for springtime. But the best part about these photos is the fact that these two look very much in love. 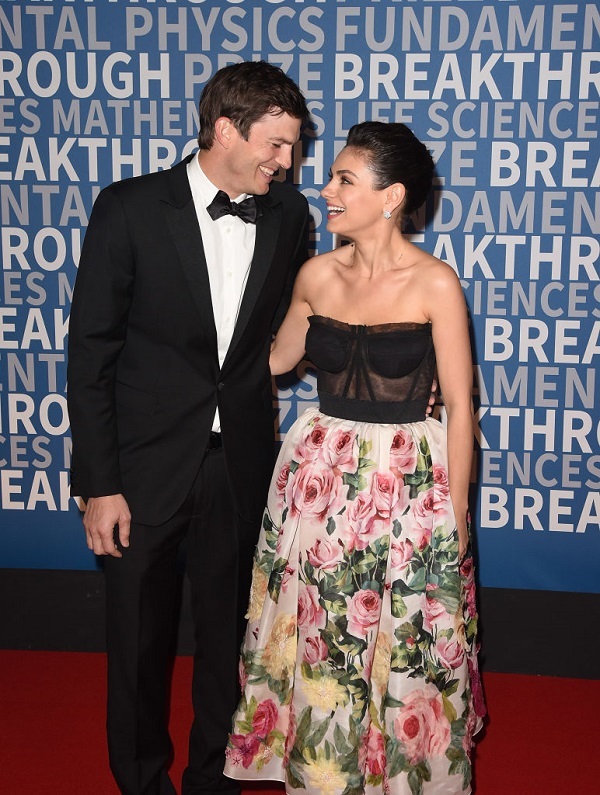 We might not know what Kutcher is saying to Kunis to make her laugh so much, but it’s just proof that these two aren’t kidding about their incredible chemistry. In fact, Kunis said in October that she still sees herself as being in “the honeymoon phase” with Kutcher, proving that their connection is legit — while their marriage is still somewhat new, the two met when Kutcher was 19 and Kunis was only 14. And although it took them a while to start dating, Kunis admitted that she had a bit of a crush on him on the set of That 70’s Show. He was also her first kiss. Hopefully these two get the chance to make more red carpet appearances together, since they obviously know how to get people talking.